Recommended for any healthcare professional and medical personnel who may respond to a cardiovascular emergency. CE‘s available for EMS and Board of Nursing! For CME’s, please take an ACLS online with skills check. **This renewal ACLS class is for those who have an unexpired ACLS certification card. Have you ever been present when the 911 call is placed for a life threatening emergency? In those types of crises, knowing basic life support skills can save the victim’s life. However, there are many times when BLS certification is simply not enough. Relying on someone trained with specialized skills to take life support one step further can mean the difference between life and death. Fortunately, this training is available – Advanced Cardiac Life Support (ACLS) for those who require a higher skill level for emergent care. In Orange County, SureFire CPR offers Advanced Cardiac Life Support (ACLS), and ACLS renewal courses. If you are currently an ACLS provider, our ACLS renewal course is designed specifically for you. Their course material adheres to the current American Heart Association guidelines and all of the ACLS renewal classes are taught by providers who are not only specialized, but have currently experience in delivering the care that they teach. SureFire CPR’s class schedules for the ACLS renewal classes are geared toward the working professional’s busy work schedule. Whether you are an individual seeking an ACLS renewal class or are a hospital education coordinator with multiple class candidates, our course availability offers the flexibility to fit into your schedule. 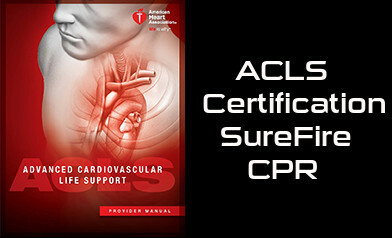 ACLS Renewal Classes Help Save Lives! As a healthcare provider having previously taken ACLS, students will find that SureFire CPR’s ACLS renewal classes are not the typical class program previously experienced. Interactive instruction with hands-on guidance allows learning to solidify while practicing skill sets required in this advanced certification. While SureFire CPR follows the AHA course content, their instructors’ ‘real world’ experience brings a refreshing present day feel to ACLS certification. SureFire CPR understands that many candidates who register for ACLS recertification come from a variety of backgrounds. Some candidates work day-to-day in an environment where the employment of Advanced Cardiac Life Support skills is common. Others seeking ACLS recertification may not currently use these skills but are required to have to competency for employment requisites. Perhaps some health care professionals have been ACLS providers who have never faced the necessity to put these skills into practice. The instructors at SureFire CPR understand this and make the effort to gear the delivery of ACLS recertification instruction to the specific needs of each and every candidate. Advanced Cardiac Life Support recertification is a key element in the ongoing goal of quality health care delivery for all healthcare professionals. ACLS recertification ensures that these health care providers stay current on all of the essential skills, including the theory behind the skill sets, in order to provide care in today’s complex health care environment. Consider the individual circumstances surrounding a provider’s requirement for ACLS certification – perhaps you are employed in a busy emergency department at your local hospital or you are a cardio thoracic intensive care RN, or maybe you are a first responder Paramedic providing life saving care in Orange County. The skill and theory taught in Advanced Cardiac Life Support recertification is essential to each of these roles. A current certification in ACLS, especially an American Heart Association approved course, speaks to the commitment you value in providing excellent care. Surefire CPR recognizes this and wants to support you in your quest for excellence in care. Call us today at (888) 277-3143 to schedule your course – we’re available and ready to help you on the next step toward becoming a more specialized healthcare provider.